One of the things I love about summer is eating fresh seafood. Seafood done right has an earthy taste like nothing else. That taste that you can never quite put your finger on is Old Bay Seasoning. A beautiful blend of spices that give food a melody you will want to experience over and over. Not being able to always get fresh seafood, I look for other ways to use this wonderful spice blend. We love an old country shrimp boil and potatoes are a main component of this Southern classic recipe. So for a shrimp boil component any night of the week, we hope you will love these Crispy Roasted Old Bay Potatoes! Preheat oven to 425 degrees F. Boil potatoes whole in salted water until a toothpick can go all of the way through. Do not over boil! * Here, I use my Instant Pot. I place whole potatoes in with 1 cup of water and salt the water well. Close the lid, seal the vent and pressure cook for 10 minutes. They come out perfect every time! After potatoes have cooled, cube the potatoes to bite size pieces. Spread in an even layer on a greased sheet pan with chopped onions. Drizzle with olive oil and mix well to distribute oil. Sprinkle with salt, pepper, Old Bay and Parmesan Cheese. Mix again lightly and spread back into a single layer. Bake in 425 degree oven for 25-30 minutes stirring halfway through, until crispy and brown. 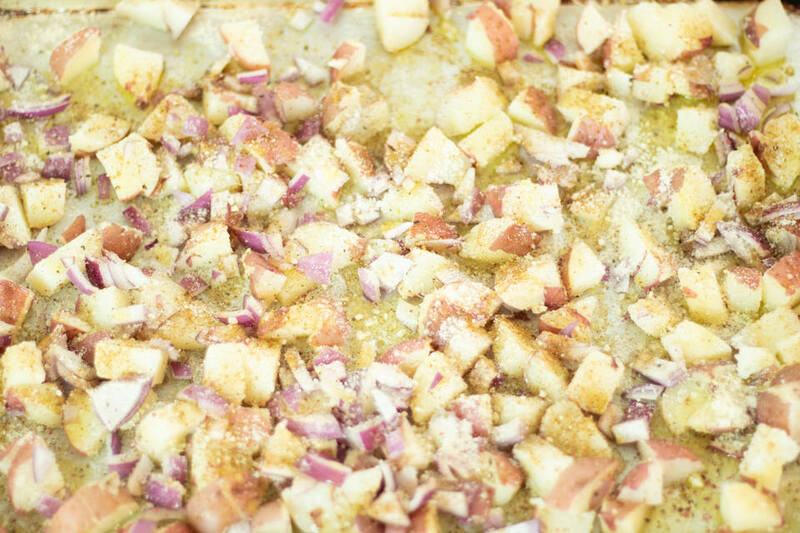 Make a side of potatoes crispy and wonderful with Old Bay Seasoning! When you are hankering for a little Southern summertime, make these wonderful potatoes for a side dish that will be the star of any meal!